In their warts-and-all report, the consultants issued a number of warnings, including concerns about low wages, foreclosures, and easy credit. On the bright side, however, they discovered that the city’s financial institutions were strong and the business environment was excellent. With an immigrant population of less than 1 percent, a steadfast “color line,” and practically no unionization, Lynchburg appeared immune to the prospect of labor unrest or protests of any kind. Even so, the consultants feared that outside agitators might someday reach the city. During the postwar boom of the 1950s, Lynchburg caught the eye of several companies—most notably, the Babcock & Wilcox Nuclear Power Generating Group and General Electric’s Mobile Radio Division. Both companies opened offices and factories in the city. Job opportunities expanded, bringing a wave of new employees from out of town. But, as Wade continues to describe the situation, the sudden influx of newcomers was not the only big change afoot in Lynchburg. 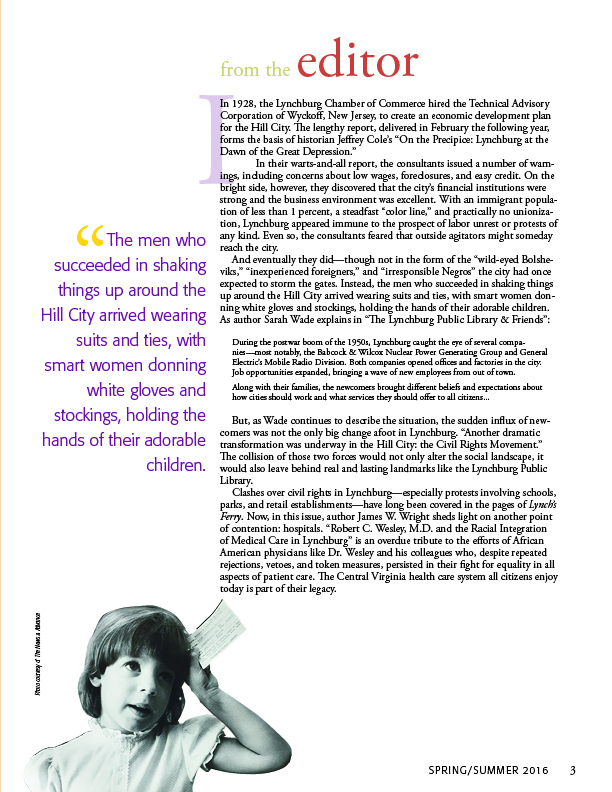 “Another dramatic transformation was underway in the Hill City: the Civil Rights Movement.” The collision of those two forces would not only alter the social landscape, it would also leave behind real and lasting landmarks like the Lynchburg Public Library. Clashes over civil rights in Lynchburg—especially protests involving schools, parks, and retail establishments—have long been covered in the pages of Lynch’s Ferry. Now, in this issue, author James W. Wright sheds light on another point of contention: hospitals. “Robert C. Wesley, M.D. and the Racial Integration of Medical Care in Lynchburg” is an overdue tribute to the efforts of African American physicians like Dr. Wesley and his colleagues who, despite repeated rejections, vetoes, and token measures, persisted in their fight for equality in all aspects of patient care. The Central Virginia health care system all citizens enjoy today is part of their legacy.